Over the last couple of weeks, I have been using the Exuviance CoverBlend Skin Caring Foundation SPF 20 that I was given at #BloggersBall by the lovely Exuviance team. Exuviance is a skincare brand that corrects the visible signs of ageing, improves skin texture and tone, add firmness, enhance suppleness, refine pores, manage acne prone skin, hydrate and restore healthy skin. "The Exuviance line contains the best clinically proven, state of the art technologies available today, all widely accepted by dermatologists the world over and supported by independent peer-reviewed scientific articles in every major journal of medical and cosmetic dermatology. Begin your skincare routine with the ideal selection of ingredients specifically designed for your skin type. Individual products formulations and concentrations of ingredients are meticulously designed to maximise benefits and address every skincare need and skin type. Intensive targeted treatments address specific anti-ageing concerns to complement or boost results from your daily skincare regimen." After hearing a lot about the brand and their claims, I was excited to try out the foundation and put it to the test. Foundations can be quite tricky and I was interested to see how it could adapt to different skin types, to help tackle said persons skincare needs. 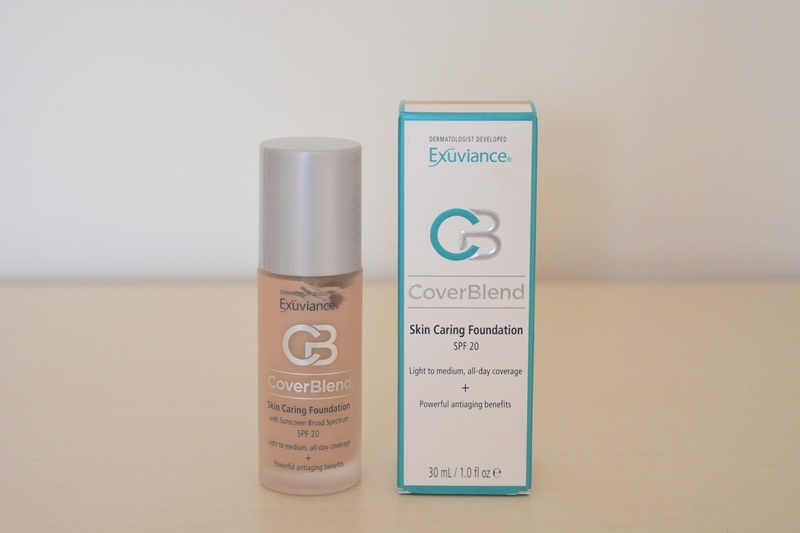 Exuviance CoverBlend Skin Caring Foundation SPF 20 is a lightweight foundation that can be built up depending on how you like your coverage, from light to medium you can tailor it to suit your preference. It is perfect for natural coverage and helps even out your skin tone, smoothing over any blemishes. It is great for those days when you want minimal makeup and don't want to go to lots of effort. Despite the lightweight foundation, it can still provide flawless and even coverage. One of the things I love about the foundation is that it doesn't clog up pores and allows your skin to breathe, whilst looking good. It also isn't oily and doesn't make you look like you have just ran a marathon, it is a natural looking foundation and I have been really impressed with it. I have also used a bigger quantity when I have wanted fuller coverage and the results have been just as good. In regards to helping reduce the signs of ageing, I can't really say how effective this has been as I am only 21 and I feel it has more preventive measures in terms of ageing. It contains SPF, which helps prevent signs of ageing as it protects from the suns rays' and keeps skin looking young. This is a great element to have in any skincare product, with various celebrities and dermatologists have said a key part of a skincare regime should be applying SPF of some form to your face every day. It really does make a difference, and maintains skin's elasticity and youthfulness.